There's no doubt that Comic-Con is the place to be for fans excited about The Hunger Games: Mockingjay - Part I with the trailer premiering here in San Diego this weekend before hitting Samsung tablets exclusively. And now there's one more goodie in store to spark the revolution as WK Interact was commissioned by Lionsgate to create this Comic-Con exclusive poster. It's got a guerrilla revolution graffiti style to it, almost like it's a poster for a rock band or something like that. But of course the symbol of the Mockingjay is easily spotted. Check out yesterday's living statue portraits, and stay tuned for more! Look! 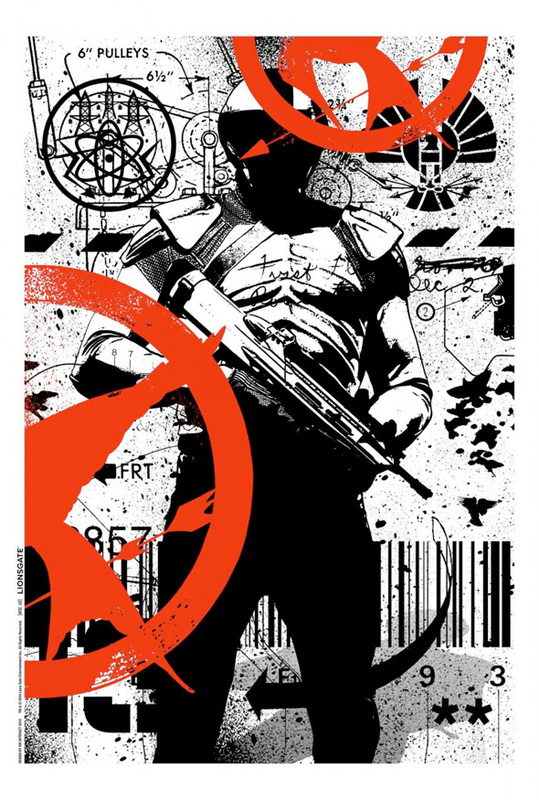 For those of you who are unable to make it to Comic-Con down in San Diego this year, just head over to TheHungerGamesExplorer.com to sign up for the chance to win a signed copy of this great poster! Weird, for a second I thought it was by Futura, but it's still pretty good. Shame it doesn't have the motion he usually puts in. His work is great. What happened to the glossy future look? This is okay, I suppose. They are mocking us with this marketing ploy.